Embedded Software is a key element in every embedded project that is used to run the micro-controller to perform the desired operations. In our daily life, we frequently use many electronic devices such as washing machines, refrigerators, mobile phones, security system, digital camera so on which will be controlled using embedded C program. If you press a button to take a photo with your digital camera, then micro-controller will perform the functions essential to capture the image and store it. This article presents basics of embedded systemsmicro-controller consists of many ports to construct the embedded C programming tutorial. Generally single line comments are useful for the programming languages that can be used to explain a part of the code. The single line comments starts with double slash(//) which can be placed anywhere in the program. Single line comments are used to ignore complete line in a program. 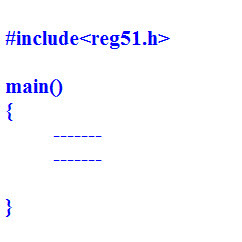 The multi line comments starts with single slash and an asterisk (/*) that can be used to explain a block of code. The multi line comments can be placed any where in the program. 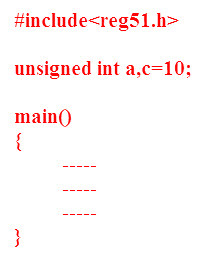 The multi line comments are used to ignore a complete block of code in a program. Which can be called as a header file, containing C declarations and macro definitions to be shared between several source files. The #include directive is normally used to include standard library such as study. h that can be used to access I/O functions from the C library. The #define directive normally used to define the string of variables and to assign the values by performing the operations in a single instruction it can be defined as macros. In every micro-controller consists of many ports, each port contains many pins which can be used to control the interfacing devices. 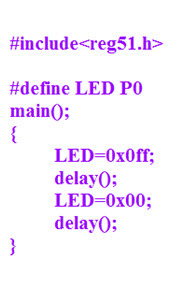 These pins are declared in a program using keywords. 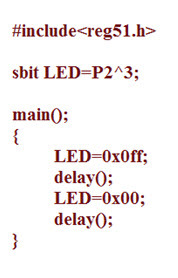 The embedded C has consist standard and predefined keywords such as bit, sbit, SFR which can be used to declare the single pin and bits in a program. This data type is used in case of accessing a single bit of SFR register. Explanation: If we assign p2.1 as ‘a’ variable, then we can use ‘a’ instead of p2.1 anywhere in the program, which reduces the complexity of the program. This data type is used for accessing the bit addressable memory of RAM (20h-2fh). Explanation: It is a bit sequence setting in a small data area that is used by a program to remember something. 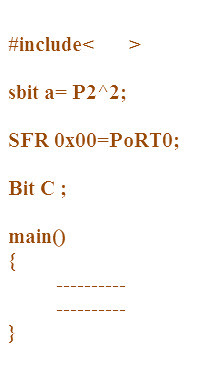 This data type is used to get the SFR register peripheral pots by another name. All the SFR registers must be declared with capital letters. Explanation: If we assign 0×80 as ‘port0’, then we can use 0×80 instead of port0 anywhere in the program, which reduces the complexity of the program. ‘Special Function Register’ is represented as SFR register. Microcontroller 8051 has 256 bytes of RAM memory, which is separated into two parts: the first part of 128 bytes is used for data storage, and the other of 128 bytes is used to SFR registers. All peripheral devices like timers and counters, I/O ports are stored in the SFR register, and each element has a unique address. 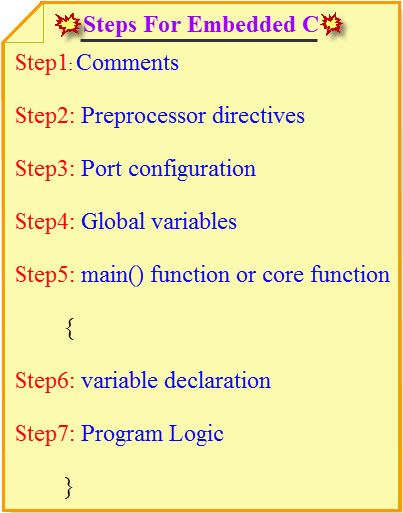 The variable declared before the main function is called a global variable, that can be accessed on any function in the program. The life time of the global variable depends on the program until program comes to an end. The main function is a core of every program execution, starts with main function only. Every program uses only one main function because if program contains more than one main function, then the compiler will get confused where to start the program execution. The variable is a name that can be used to store the values. That variable must be declared before used in the program. The declaration of a variable specifies its name and data type. The storage representation of data is called data type. The embedded C programming uses four basic data types such as float, integer, character, etc. used to store the data in the memory. The size and range of data type defined based on compiler. The plan of path is called a program logic that presents the theory behind and expected outcomes of a program’s actions. It describes the assumption or theory about why the program will work, showing the acknowledged effects of activities or resources. 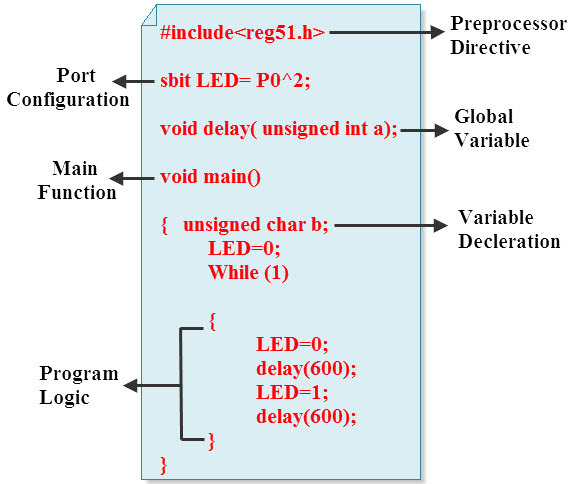 Hope this article gives basic information to the beginners of embedded C programming. 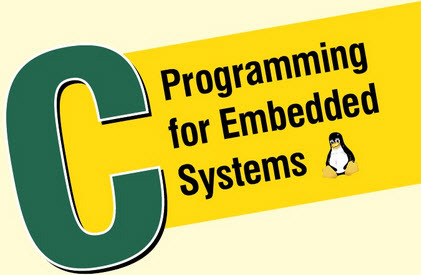 Good understanding of the Embedded C programming is most essential for designing embedded based projects. We encourage and welcome queries, suggestions and comments from our readers. Therefore, you can post your queries and feedback about this article in the comments section given below. And also,the Code,Circuit diagram and other documentation can be shared with you once purchase the project. hello sir, this is sanket i am an electronics engineer. i want to know that, do you also conduct embedded c programming courses? if yes then please provide me all the details regarding courses. Sorry,we don’t provide any kind of courses,but we develop the projects based on embedded C programming and also we can give you the 100% support regarding your technical queries in order to complete your project efficiently. I am embedded Trainer, at private firm, your article is very nice and also your embedded projects. I have also many ideas regarding embedded projects with IoT. I want to develop one best home automation product which is operated by Iot. can you help me regarding home automation? at just now i am using PIR, DHT 11 and MQ 2 sensors for motion , fan speed control and LPG leakage respectively so which other sensors I have to use? I am very proud to say thanks.